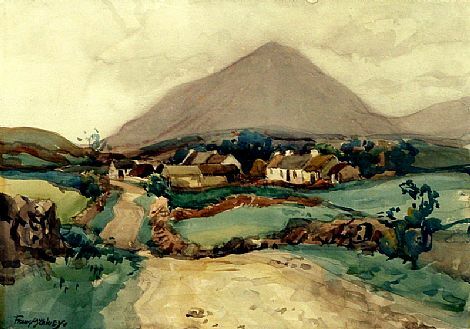 Landscape and portrait painter, Frank McKelvey attended the Belfast School of Art where he won the Sir Charles Brett prize for figure drawing in 1912. He won immediate recognition in Dublin for his landscapes and his work was hung at the RHA. From 1918 until 1973 he acquired the remarkable record of never missing a year at the RHA showing from three to eight works annually. He was made a full member of the RHA in 1930 and was one of the first Academicians of the Royal Ulster Academy.